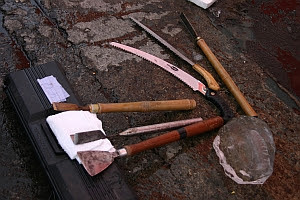 Paete's townsfolk re-invented themselves from wood carvers to carving butter, vegetables, chocolate, and ice years ago due to the dearth of wood to support the industry, fueled by the growing demand for kitchen artists and chefs by hotels and restaurants here and abroad. 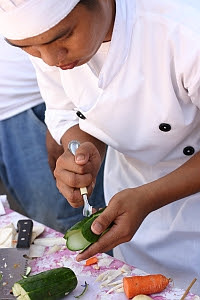 Every 24th of July, a day before the town fiesta in honor of St. James the Apostle, Paetenians (or Paeteños) hold the annual Culinary Arts Festival: a competition of vegetable carving, ice and bar tending at the town plaza. 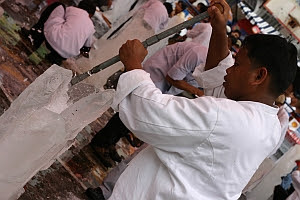 An ice sculpture made from several blocks of ice joined together (in physics, this process is called ice sintering) to create the larger block required for the ice structure. This is not an entry in the competition as it's sculpted by professionals. Notice also the Emperador bottles, one of the sponsors of this annual event. The red and white canopy provided some relief from the heat of the searing sun and acted as diffuser from the harsh lighting available. 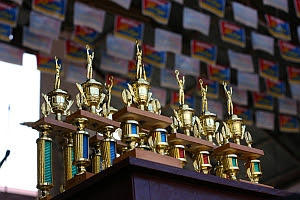 The winners of the contest were awarded trophies and training/employment opportunities in some Manila hotels. Wasn't able to take pictures of the bartending contest held later. Went instead to Kape Kesada, Wawa Park and nearby Exotikk Restaurant. 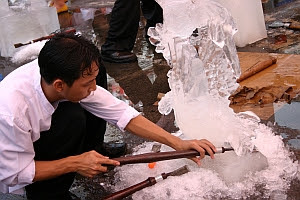 If ever any of the readers is looking for an ice carver for weddings and other events, just drop a comment and Tutubi may be able to find someone to render the service for you. it must have been a rare treat to watch those talented crop of our youth at work! very nice shots! I enjoyed the photos. 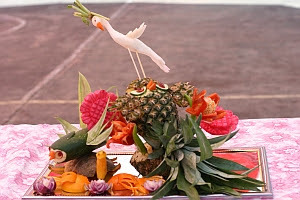 I've never been to a food carving competition before but from the photos, I now know what it's like. The carvings are simply beautiful! Both the food & ice carvings are beautiful. feast for the eyes and the stomach. those ice sculptures remind me of our own impermanence. beauty held in a fleeting vessel. Ay, ang galing grabe! 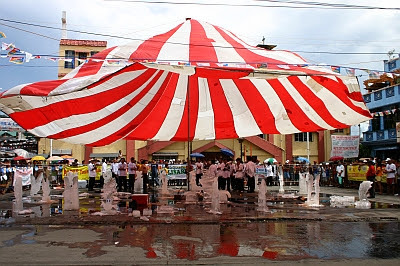 All those talent came from Paete? 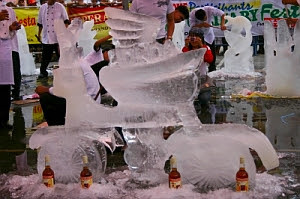 All those ice, and food carving are really world-class. Whoa! So the talents are in Paete. Now I know where to look. Wow, those are amazing art; a feast for the eyes...and palate. Sayang I wasn't there. What a nice event. Thanks for the pictures. hi, awesome pics you have here, was surfing for some possible ice sculptor services for a 2010 wedding and i happened to see this blog, quite an old one thou so not sure ill still get a reply on this, but just in case if you could recommend numbers of these artists i can speak with and hire for a weddin event kindly shoot me a mail at ricoteeya@gmail.com. thanks much! hi, can i kindly ask for referals for these gret ice sculptors, need to hire their services for a wedding event. if you could kindly email numbers/contact person at ricoteeya@gmail.com. many thanks! 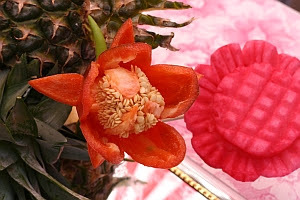 It is such a wonderful competition with magnificent work of art from the vegetables/fruits to the ice sculpture. They are both stunning in their own way since we are all very much taken a back with this designs and creativity. Have a Happy New Year and a Prosperous 2012 ahead. 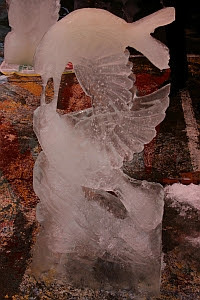 hi i'm looking for an ice carving supplier for a specific event..could anyone give me contact details. 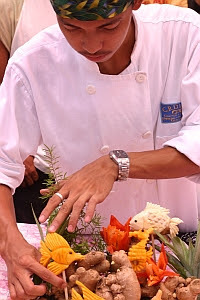 Same here!Looking for a food/ice carving speaker for a regional convention. Grabe ang galing naman nila jan. 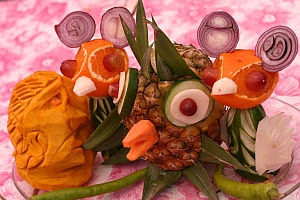 I am also a vegetable carving here in abroad pero ok din gawa nila.